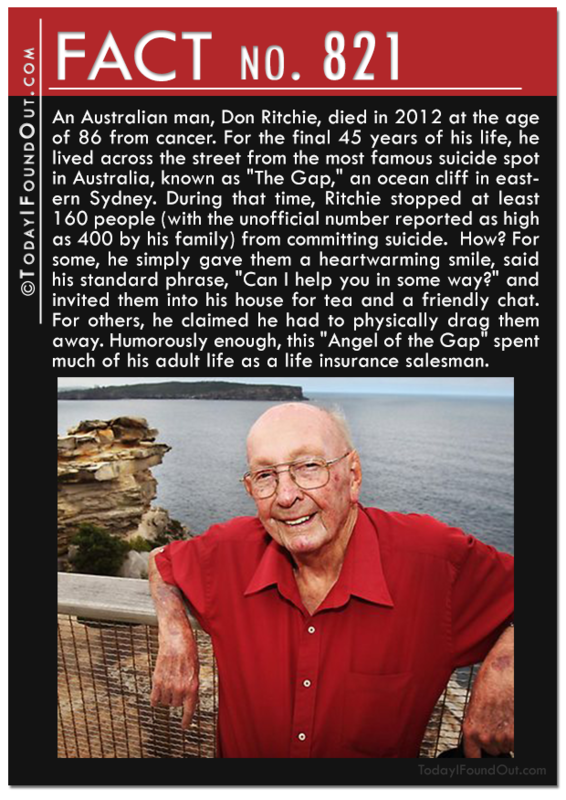 Quick Fact 821: An Australian man, Don Ritchie, died in 2012 at the age of 86 from cancer. For the final 45 years of his life, he lived across the street from the most famous suicide spot in Australia, known as “The Gap,” an ocean cliff in eastern Sydney. During that time, Ritchie stopped at least 160 people (with the unofficial number reported as high as 400 by his family) from committing suicide. How? For some, he simply gave them a heartwarming smile, said his standard phrase, “Can I help you in some way?” and invited them into his house for tea and a friendly chat. For others, he claimed he had to physically drag them away. Humorously enough, this “Angel of the Gap” spent much of his adult life as a life insurance salesman. 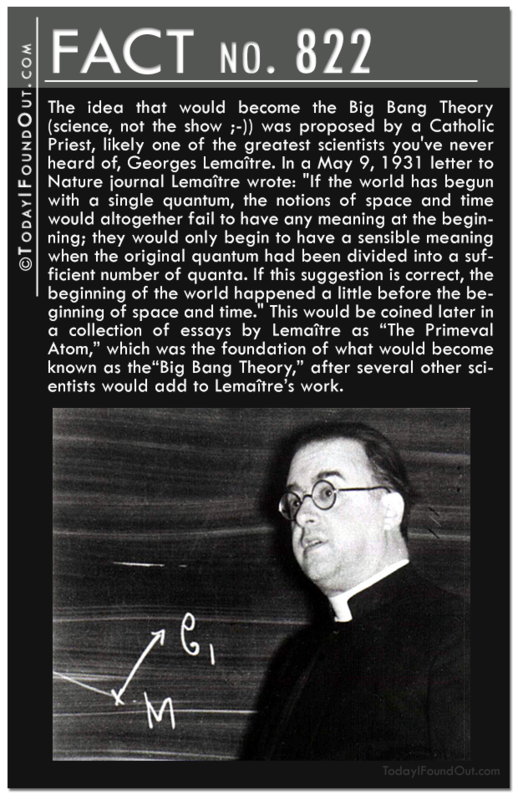 Quick Fact 822: The idea that would become the Big Bang Theory (science, not the show ;-)) was proposed by a Catholic Priest, likely one of the greatest scientists you’ve never heard of, Georges Lemaître. In a May 9, 1931 letter to Nature journal Lemaître wrote: “If the world has begun with a single quantum, the notions of space and time would altogether fail to have any meaning at the beginning; they would only begin to have a sensible meaning when the original quantum had been divided into a sufficient number of quanta. If this suggestion is correct, the beginning of the world happened a little before the beginning of space and time.” This would be coined later in a collection of essays by Lemaître as “The Primeval Atom,” which was the foundation of what would become known as the“Big Bang Theory,” after several other scientists would add to Lemaître’s work. 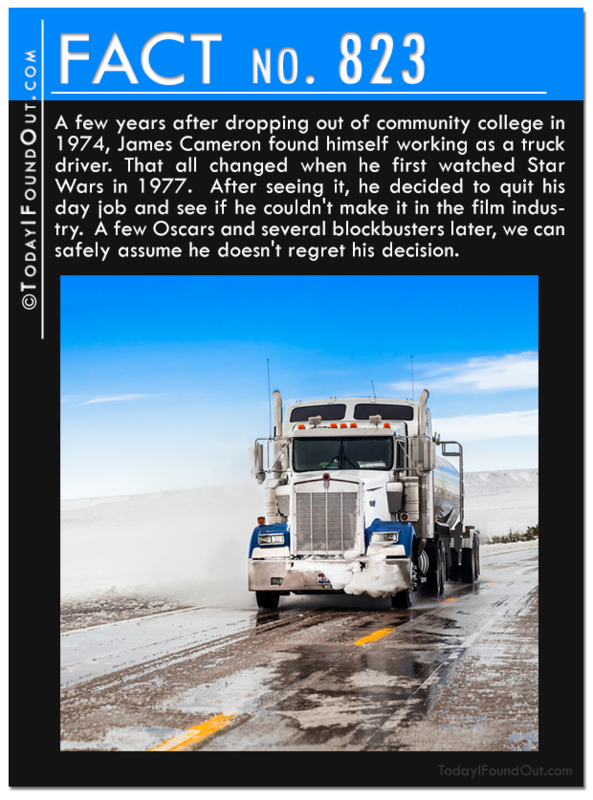 Quick Fact 823: A few years after dropping out of community college in 1974, James Cameron found himself working as a truck driver. That all changed when he first watched Star Wars in 1977. After seeing it, he decided to quit his day job and see if he couldn’t make it in the film industry. A few Oscars and several blockbusters later, we can safely assume he doesn’t regret his decision. Quick Fact 824: The original title of one of the most popular novels of all time, Pride and Prejudice, was First Impressions. The title change is thought to have happened because Jane Austen wrote much of her novel from 1796-1797, but didn’t publish it until 1814, at which point there were two other works with the same title out by Margaret Holford and Horace Smith respectively. 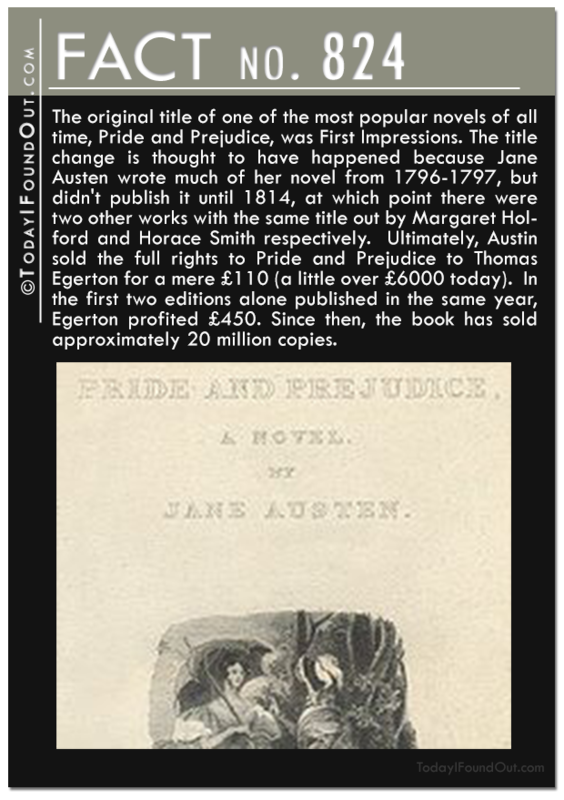 Ultimately, Austin sold the full rights to Pride and Prejudice to Thomas Egerton for a mere £110 (a little over £6000 today). In the first two editions alone published in the same year, Egerton profited £450. Since then, the book has sold approximately 20 million copies. 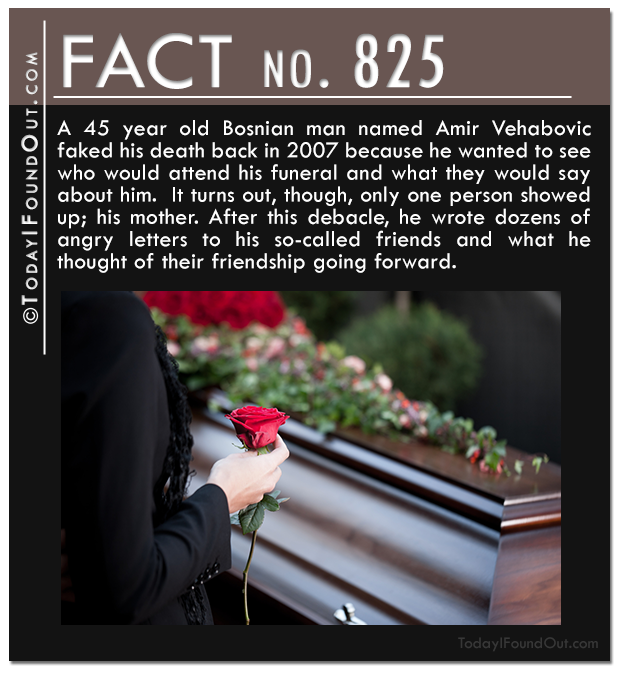 Quick Fact 825: A 45 year old Bosnian man named Amir Vehabovic faked his death back in 2007 because he wanted to see who would attend his funeral and what they would say about him. It turns out, though, only one person showed up; his mother. After this debacle, he wrote dozens of angry letters to his so-called friends and what he thought of their friendship going forward. 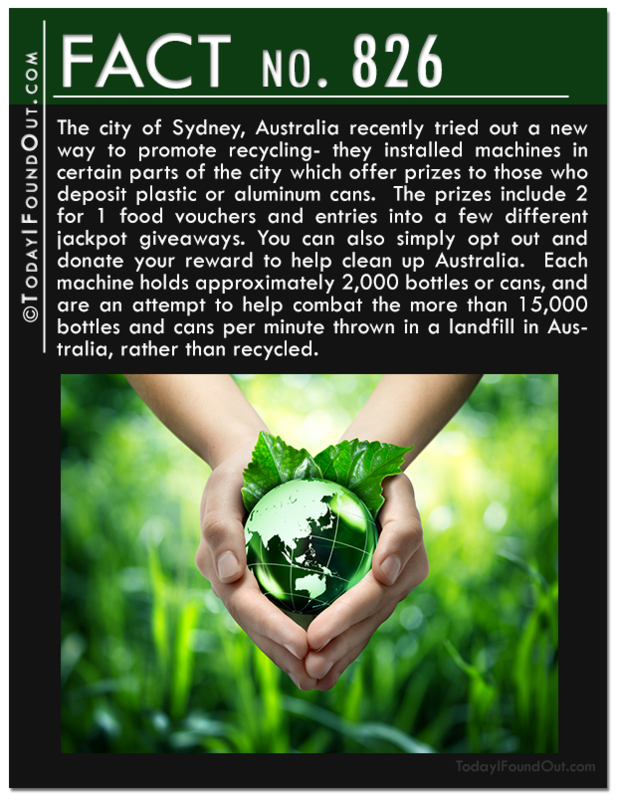 Quick Fact 826: The city of Sydney, Australia recently tried out a new way to promote recycling- they installed machines in certain parts of the city which offer prizes to those who deposit plastic or aluminum cans. The prizes include 2 for 1 food vouchers and entries into a few different jackpot giveaways. You can also simply opt out and donate your reward to help clean up Australia. Each machine holds approximately 2,000 bottles or cans, and are an attempt to help combat the more than 15,000 bottles and cans per minute thrown in a landfill in Australia, rather than recycled. 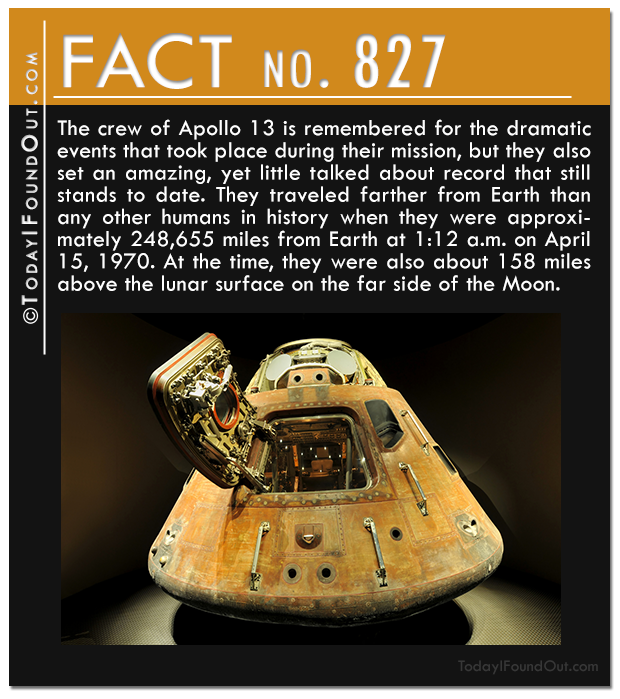 Quick Fact 827: The crew of Apollo 13 is remembered for the dramatic events that took place during their mission, but they also set an amazing, yet little talked about record that still stands to date. They traveled farther from Earth than any other humans in history when they were approximately 248,655 miles from Earth at 1:12 a.m. on April 15, 1970. At the time, they were also about 158 miles above the lunar surface on the far side of the Moon. Quick Fact 828: In December of 2013, Pope Francis revealed that while a student, he worked as a bouncer at a Buenos Aires nightclub. 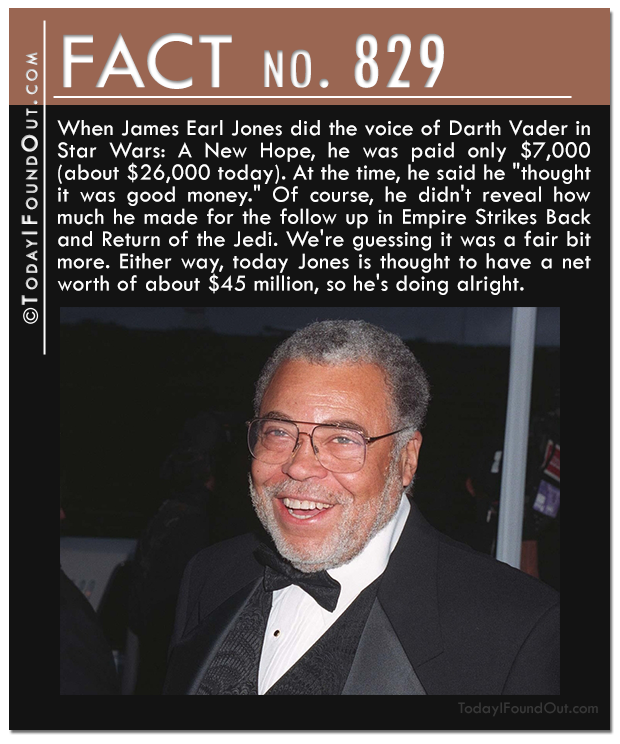 Quick Fact 829: When James Earl Jones did the voice of Darth Vader in Star Wars: A New Hope, he was paid only $7,000 (about $26,000 today). At the time, he said he “thought it was good money.” Of course, he didn’t reveal how much he made for the follow up in Empire Strikes Back and Return of the Jedi. We’re guessing it was a fair bit more. Either way, today Jones is thought to have a net worth of about $45 million, so he’s doing alright. Quick Fact 830: Fifteen year old Spencer Lacey Ganus was originally paid just $926 to voice the role of teenage Elsa in Frozen. The film, of course, went on to gross over a billion dollars. In the end, she received an additional $10,000 in residuals, which she says she put in a college fund. Among other roles, as a toddler Ganus also did the voice of Ike Broflovski in several episodes of South Park from 2002-2004.